The future global economy is expected to consume more energy, especially with the growing energy demand from the developing countries, such as China and India. Additionally, the risk of climate change associated with the use of fossil fuels, has made supply of energy increasingly difficult. The quantum dots market is expected to grow at a significant rate during the forecast period. The market is estimated to witness growth at a CAGR of 46.4% over the period of 2016 to 2022. This is due to the growing demand of quantum dots from developing countries which is providing ample growth opportunities for quantum dots market. Growing demand of quantum dots in display devices and energy efficiency offered by quantum dots are some of the factors driving the growth of quantum dots market. However, slower adoption of the technology and utilization of heavy metals as raw material are restraining the growth of the global quantum dots market. North America led the global quantum dots market in 2016 followed by Europe. Asia Pacific quantum dots market is expected to grow with the highest rate during the forecast period and overtake the position of Europe in global quantum dots market. Asia Pacific is still an emerging market for quantum dots technology. However, the presence of big players in the Asia Pacific market such as Samsung Electronics, Sony Corporation, and LG is expected to push the growth of quantum dots market in the Asia Pacific region. Japan and South Korea, being technologically advanced in the field of electronics and semiconductor devices, are going to drive the market in terms of technology and innovation. Partnerships, joint ventures, collaborations and contracts have emerged as preferred strategies in bringing the quantum dots market players together. The companies with similar goals are collaborating together to form joint venture programmes in order to assist each other in achieving those goals. This helps companies gain access to each other’s technologies, services and thus facilitates them to achieve their objectives faster. Some of the key players involved in this market are Evident Thermoelectrics, Invisage Technologies Inc., Nanoco Group plc, Nanosys Inc., Nn-Labs Llc, Ocean Nanotech Llc, QD Laser Inc., QD Vision Inc., Quantum Material Corporation, and Merck KGaA. • What are the prevailing device types, and materials in quantum dots? • What are the different application areas of quantum dots? • What are the factors restraining the growth of global quantum dots market? • Who are the major participants in the global quantum dots market? • Which region will lead the global quantum dots market by the end of forecast period? 8.14 Samsung Electronics Co, Ltd.
8.17 Pacific Light Technologies Corp. The future global economy is expected to consume more energy, especially with the growing energy demand from the developing countries, such as China and India. Additionally, the risk of climate change associated with the use of fossil fuels, has made supply of energy increasingly difficult. Several countries are opting for various methods for decreasing the carbon dioxide concentration. Rising energy demands globally currently calls for improved energy efficiency usage and increased energy supply. With the use of high vacuum growth reactors, the atom’s layers are deposited in a precise sequence. The atoms used in this process results in the formation of quantum dots. Quantum dots (QD) are tiny crystals having the ability to convert light from one color to another color very effectively. Quantum dots are also integrated into a film and collectively called as Quantum Dot Enhancement Film (QDEF), which replaces a diffuser film. With the introduction of numerous layers of quantum dots in active region of a solar cell, the spectral response of the cell is extended for absorption of more sun’s radiation, which is then converted into electricity. The quantum dots market is estimated to reach $7.8 billion by 2022 at a CAGR of 46.4% through the forecast period. 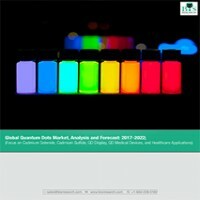 Quantum dots witnessed a major increase in adoption rate for the usage in various applications due to several advancements offered by the technology. The quantum dots market is expected to grow at a significant rate during the forecast period. This is due to the growing demand of quantum dots from developing countries which is providing ample growth opportunities to quantum dots market. Growing demand of quantum dots in display devices and energy efficiency offered by quantum dots are some of the major factors driving the growth of quantum dots market. However, slower rate of adoption of the technology and utilization of heavy metals as raw material are restraining the growth of the global quantum dots market. In terms of revenue, the cadmium selenide segment holds the major share of 31% in the global quantum dots market in 2016; whereas indium serenade segment is expected to increase with the highest CAGR in the coming years. Cadmium selenide is an inorganic compound which is black to red-black solid and categorized as II-VI semiconductor of the n-type. Three forms of cadmium selenide are known to us which are as follows: wurtzite, rock-salt and sphalerite. Cadmium selenide formed Nano particles within the range of below 10 nm delivers a property called quantum confinement. It results when the electrons are confined to a very small volume. The QD display segment holds the major share of 44% in the global quantum dots market in 2016; whereas QD solar cells segment is expected to increase with a considerable CAGR in the coming years. The quantum dots are used in various applications such as healthcare, consumer application, industrial application and others. Healthcare application is the highest revenue generating segment among all the applications of quantum dots; whereas consumer application is expected to grow with the highest rate during the forecast period. Quantum dots have been extensively used in healthcare segment. They have numerous advantages over conventional organic dyes, broad excitation and narrow emission technology. They were introduced as a biological examinations during 1998. Consumer application or gadgets are beneficial for everyday use especially in domestic usage in homes. Consumer application generally covers devices or equipment intended for entertainment purposes such as flat screen TVs, DVD players, video games, electric toys and smartphones among others. In 20th century, radio broadcasting had come up with the first consumer based product known as broadcast receiver. The later years witnessed a surge of computers, laptops, LED television in the market. Quantum dots is one of those emerging technologies which is capable enough to transform the consumer application market as a whole. Maximum revenue generated in 2016 from the quantum dots was from the North American countries followed by European countries. The US has always been on the forefront of the world map when it comes to technological advancement. Like other disruptive technologies, quantum dots has also extended its roots in the US market. In terms of manufacturing, most of the prominent companies are US based, offering significant impetus to the growth of this market in the US as well as the whole of North America. Even the companies which are not US based have significant presence in the US, either because of their manufacturing facilities or R&D bases. Another region expected to generate considerable revenue from the quantum dots is Asia Pacific, which is expected to take the position of Europe market during the forecast period. Asia Pacific is still an emerging market for quantum dots technology. However, the presence of big players in the Asia Pacific market such as Samsung Electronics, Sony Corporation, and LG is expected to push the growth of quantum dots market in the Asia Pacific region. Some of the key players in the industry are Evident Thermoelectrics, Invisage Technologies Inc., Nanoco Group plc, Nanosys Inc., Nn-Labs Llc, Ocean Nanotech Llc, QD Laser Inc., QD Vision Inc., Quantum Material Corporation, and Merck KGaA.